Attending a National College Fair is a great opportunity for students in grades 8-12 to talk with representatives from a variety of schools. Plus, learn about scholarship information, financial aid and how to complete the FAFSA, tips for athletes, college essay tips, and much more! There are 92 college National College Fairs offered across the United States in 2017 with over 1,800 colleges and universities participating. Go to www.gotomyncf.com to locate and register for a fair close to you. It’s FREE! Yippee! Remain open minded: Some students have their sights fixed on a particular school. 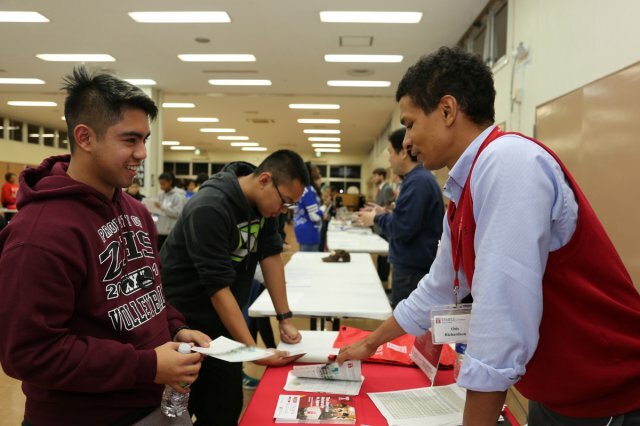 The college fair is a unique opportunity to discover schools you may not have considered. Bring a shopping bag: Vendors are going to hand you a ton of stuff. Have a bag with you so you don’t have to carry stuff around in your hands. When you go home and have more time you can lay everything out and sort through it all. Pen and small pad of paper in case you need to take notes. Using the Evernote app on your phone is also a good option. Do make a plan beforehand. There will be a ton of colleges and universities at the college fair. Take the time to plan which schools are a priority for you to visit. Decide what you will wear to the fair. There is no need to get all dressed up but you want to leave a good impression so dress appropriately. If you have a resume listing your achievements, GPA, test scores, activities you are involved in it is good to bring copies with you to hand out to representatives. Talk to everyone! Don’t just add your name and email to a list. Introduce yourself to the representatives. Write out specific questions you have for schools and take notes as you go. *(PLEASE! Think about the messages your questions give the admissions rep.) Ex. I heard your school is a party school. vs. What is the graduation rate at your school? Click HERE for 30 Questions to Ask at an Education Fair. Follow up! Ask for contact information from the people you speak to or ask if they have a business card. Ex. “It was so nice to meet you and hear about [name of school]. Thank you for taking the time. I’m hoping to visit your campus sometime in the future. May I have your business card? I’d love to keep in touch.” After the fair email them thanking them for their time and express why you have an interest in that particular school and that you can’t wait to visit.